If you purchase goods from another EU country these sales are technically known as dispatches or removals rather than exports. The term 'exports' is reserved to describe sales to a country outside the EU. (AT)Austria, (BE)Belgium, (BG)Bulgaria, (CY)Cyprus, (CZ)Czech Republic, (DK)Denmark, (EE)Estonia, (FI)Finland, (FR)France, (DE)Germany, (EL)Greece, (HU)Hungary, (IE)Ireland, (IT)Italy, (LV)Latvia, (LT)Lithuania, (LU)Luxembourg, (MT)Malta, (NL)Netherlands, (PL)Poland, (PT)Portugal, (RO)Romania, (SK)Slovakia, (SI)Slovenia, (ES)Spain, (SE)Sweden. If they're not registered for VAT in any of these countries, we should normally be charged for VAT. If you are genuinely registered for VAT in any of these countries, you can zero-rate the VAT. 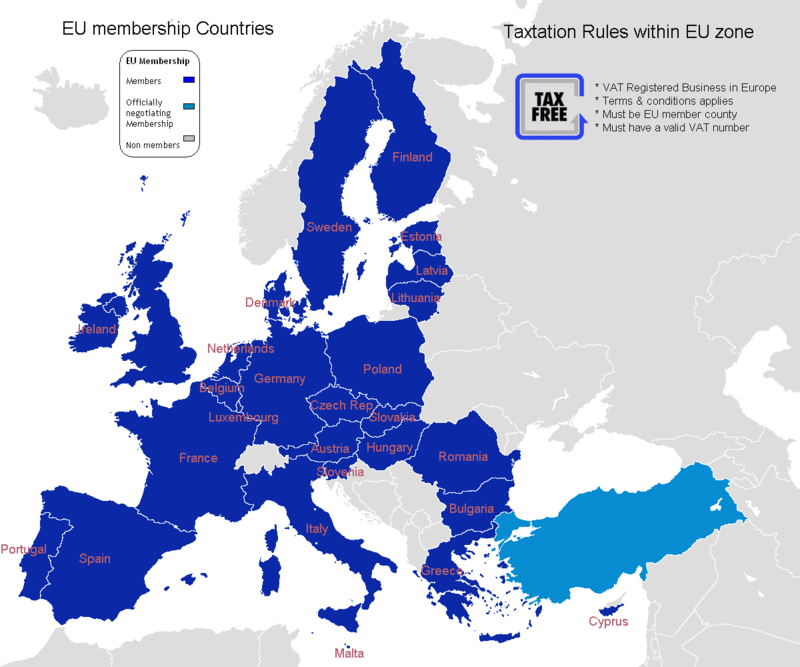 Terms & Conditions applies for VAT zero-rate (exempt) between EU membership countries. The goods are sent out of the UK to somewhere in another EU country, whoever is genuinely registered for VAT in another EU country. We must get your VAT registration number - including the two letter country code - and show it on your sales invoice with the evidence that the goods have gone out of the UK - 'evidence of removal' which is normally three months. Where the goods are going to in EU. Rest of the world (Outside Europe, Australia, Asia, Canada, South America, U.S.A) do not need to pay VAT / TAX as the goods are classified 'export goods'. However is not our responsability regarding the import duty charges on countries outside Europe (Australia, Asia, Canada, South America, U.S.A). Office working hours are 11.00am-4.00pm Monday - Friday. We will aim to respond promptly to all calls, faxes and e-mails received outside of these working hours on the following working day.